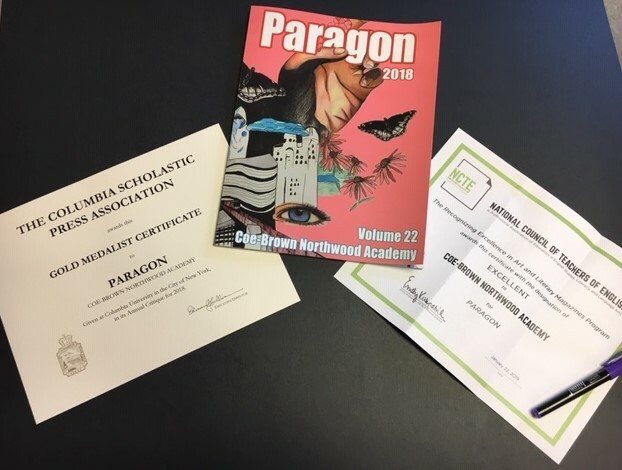 Paragon, Coe-Brown Northwood Academy’s Literary/Arts magazine has received two prestigious national awards for its 2018 edition. The magazine received a Gold Medalist Certificate from The Columbia Scholastic Press Association and a designation of Excellent from the National Council of Teachers of English. CBNA teachers Anna Hazen and Danielle Muir act as advisors for the club. Last year’s staff included editors Alicia Baratier, Emily Cunningham and Hannah Halka, with staffers Taeva Ahern, Emily Buehne, Madison Cunningham and Jocelyn Gagnon. Literary works and visual art were submitted by students school wide, then the student staff selected the pieces to be included and designed the pages for the 52 page publication. Congratulations to all of the talented CBNA students who contributed to Paragon’s success. 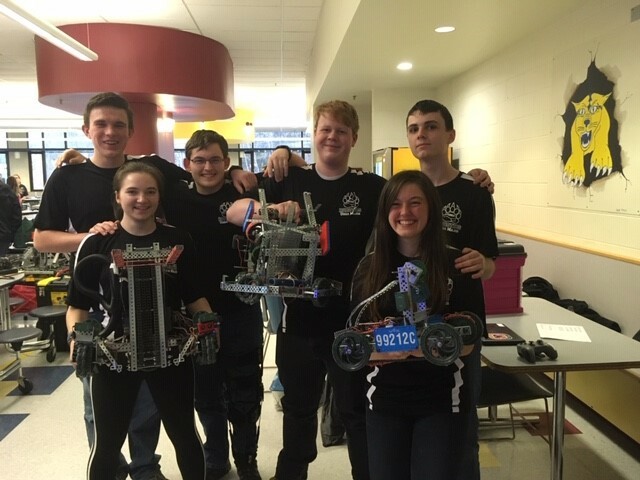 On Saturday, January 19, CBNA’s Robotics teams, Ursa Major A, B, and C, competed against 42 other teams at ConVal Regional High School in the last tournament of the season. Competition was fierce as teams tried to secure a spot in the upcoming State Tournament. All three teams finished strong in the quarterfinals qualification rounds. Team members Austin Carrier and Emily Buehne had a 7th place finish heading into the quarterfinals. Noah Sinnamon and Nick Dyer finished 19th and Cordelia Norris and Alasdair Morrison finished 23rd. Emily and Austin then became Alliance Captains heading into the quarterfinals. Choosing Team C, Nick and Noah, for their alliance, the two teams faced off in the first elimination round against two Pinkerton Academy teams. After a solid win, Teams B and C advanced to Round Two of elimination were they were outscored by teams from Thetford, Vt. All three teams had superb performances. Team C (Ruby Carr, Emily Buehne, and Austin Carrier) moved on to States. Team B (Noah Sinnamon and Nick Dyer) received the Judges’ Award. 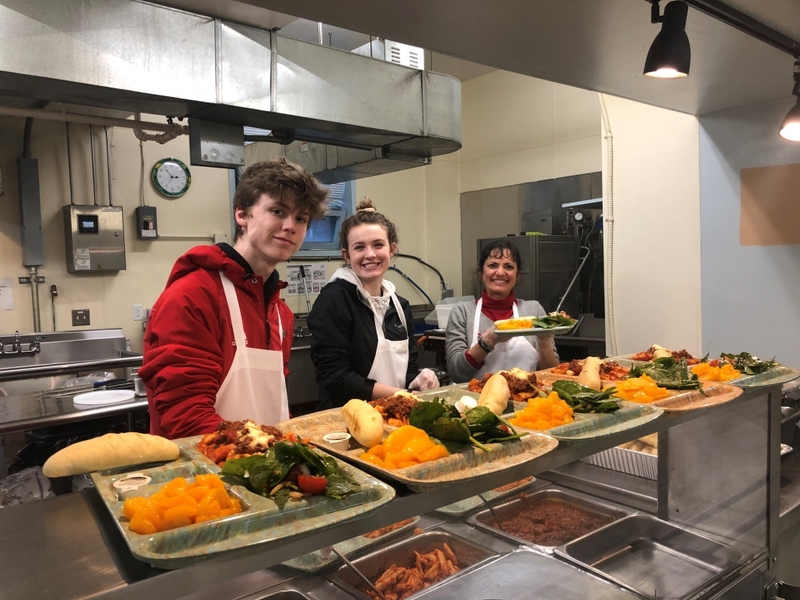 Members of Coe-Brown Northwood Academy’s chapter of Future Business Leaders of America (FBLA), along with their advisor Dr. Joann Zylak, recently volunteered at the New Horizons Soup Kitchen in Manchester serving food to homeless housed at the shelter over the holidays and were also able to donate five boxes of food donated by the CBNA community. FBLA members were also able to donate a number of donated/collected items including clothes, blankets, toys, shoes and boots to Angie’s Shelter for Women in Manchester as part of the FBLA goal of helping the community. Coe-Brown Northwood Academy Theatre will proudly present William Shakespeare’s romantic romp, Love’s Labor’s Lost, Thursday, Friday and Saturday October 25, 26 & 27, 2018, at 7 PM, in the Gerrish Gym on the CBNA campus. One of Shakespeare’s early comedies, this adaptation is set in Navarre High School, circa 1999. The story concerns four students, led by Ferdinand, who swear oaths of no fun, no food and no females in order to focus on their studies, and ask a bunch of other students to do the same. However, when four young ladies led by the Princess of France, come for a visit, they (of course) break those oaths by falling in love, writing poetry and disguising themselves as Russians (What???). Witty wordplay, misdirected love notes, tricks, the prom and the course of true love ensue. The cast includes seniors Braelin Ash, Shayla Ashley, Brian Downer, Mackenzie Flanders, Cooper Leduke, Lily Marston, Paige Marston, Olivia Roach; juniors Emily Dallaire, Patrick Helm, Brianna Jackson, Shannon Jackson, Mirah Johnston, Connor Nowak, Caitlin Reynolds, Rylee Rogers, Lauren Rose, Eva Turcotte; sophomores Mary Katherine Patteson, Ben Poirier, Clayton Price, Aiden Schutte, Darin Sweet, Jordan Trahant and freshmen Sabrinalin Jeffers, Mairead O’Shea, Calvin Swett and Caleb Yates. Production stage manager junior Madison Bowen will be leading an experienced production team of skilled theatre technicians who will bring Love’s Labor’s Lost to life. The production is directed by faculty member Elizabeth Lent with assistance and choreography from faculty member Kolby Hume. Reserved tickets are $10 for adults and $8 for students and seniors, and are available at http://cbnanh.booktix.com. For further information, call 942-5531, ext. 237, or email elent@coebrown.org. Hope to see you there. Coe-Brown Northwood Academy is pleased to announce that our Annual Homecoming will be celebrated on Friday & Saturday, September 14 & 15, 2018. 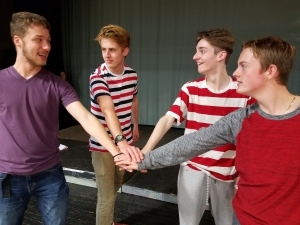 The weekend will kick off with “Red and White” day for students on Friday, followed by the family friendly Comedy Hypnosis Show Steve Wronker’s Funny Business at 7 pm ($10) in the Gerrish Gym. A full day of fantastic family activities is planned across the campus for Saturday the 15th including athletic events: Bass Fishing at 8 am, Cross Country vs. Portsmouth and Bow at 9 am, Girls JV/V Soccer vs. Oyster River at noon, Boys JV/V Soccer vs. Plymouth at 2 pm and Girls R/JV/V Volleyball vs. St. Thomas at 2:30, 3:45, and 5. To get the day started there will be a pancake breakfast hosted by the CBNA Chapter of FCCLA from 8-10 am in the Smith Hall Lobby. Pre-sale tickets are $8 per person or $25 for a family of 4 or more, or $10 per person or $30 for a family of 4 or more at the door. Contact Mrs. Morales for more info at amorales@coebrown.org. Other activities during the day will include a woodman’s demo, silent auction, and activity booths. Concessions will be offered throughout the day. Homecoming Saturday will end with a homecoming semi-formal dance sponsored by the senior class for current students from 7 – 10 pm. For more information about any of the events, contact CBNA at 603-942-5531. Whether you attend Homecoming every year or have never been, this is the year to check it out! Hope to see you there. Twenty members of the Coe-Brown Northwood Academy Much-To-Do Chapter of FFA, and their advisors Mrs. Sarah Ward and Mr. Charles Whitten recently attended the 88th State FFA Convention for student recognitions in CDEs (Career Development Events), SAE (Supervised Agricultural Experiences), Proficiencies (excellence in a particular field or area of agriculture done on their own time), Scholarships, State degree recipients and other special recognitions, held at the Mount Washington Hotel in Bretton Woods, NH. 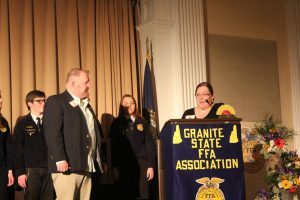 The convention, themed “Activate Change, Spark Passion” featured a speech by National Central Region FFA Vice-President, Piper Merritt and a keynote address by Glenn Lucas of Northwoods Law who shared what his life is like as NH Game Warden. He also talked about the importance of communication and leadership. The following recognitions were awarded to CBNA students: Chapter Delegates: Madeleine Lounsbury and Colin Gollihur; Chapter Nominating Committee Member: Joe Garcia; Chapter Courtesy Corps: Ashely Gatchell and Ben Peverly; Chapter Representative: Madeleine Lounsbury. State Officer Candidate Sarah Jensen was elected FFA State Treasurer for the upcoming school year 2018-2019. Samantha Schroder was awarded the Eastern State Exposition Scholarship of $1000, as well as the $500 FFA Foundation Scholarship. The SAE (Supervised Agricultural Experiences) Awards were as follows: Star SAE, Entrepreneurship – Matthew Messenger – Gold, 2nd place and John Renner-Silver, 3rd place; Star SAE, Placement Gold, 2nd place to Courtney Gervais, Silver, 3rd place to Colin Gollihur and Bronze, 4th place to Patrick Murray. An Outstanding Chapter Officer Award went to Sarah Jensen. Proficiency Awards went to the following students: in Dairy Production, Entrepreneurship – Winner Gold – Olivia Pittman. In Nursery Operations – Winner Gold – Faith Wilson; in Ag Sales – Gold, 2nd place – Madeleine Lounsbury; in Div. Livestock Entrepreneurship – Gold, 2nd place – Joe Garcia; and in Equine -Silver, 3rd place Jordan Bell. The CDE (Career Development Event) results were as follows: the Ag Sales and Service Team consisting of Breanna Demerritt, Molly Swansburg, Patrick Murray, and Tucker Hill received second place overall; in Demonstrations Senior Division Devin Sullivan placed first overall; the Floriculture-Team consisting of Sarah Jensen, Molly Swansburg, Breanna Demerritt and Madeleine Lounsbury placed fourth overall. Sarah Jensen received first -first place individual in Floriculture; in Floral Design Mixed Media Design, Sarah Jensen earned Best in Show and Molly Swansburg was in second place overall. The Forestry Team consisting of Devin Sullivan, Elizabeth Parece, Daydrian Morin and Tyler Millette placed third overall. The Nursery/Landscape Team of Devin Sullivan, Matt Messenger, John Renner, and Colin Gollihur was second overall with Devin Sullivan in second place high individual. In the Impromptu Speaking-Novice Division Kirin Asselin placed second overall. In addition to all the student recognition, Mr. Charles Whitten was recognized with the Connor Memorial Outstanding Teacher/Advisor Award. Congratulations to the CBNA FFA Much-To-Do chapter for its outstanding showing on the state level. 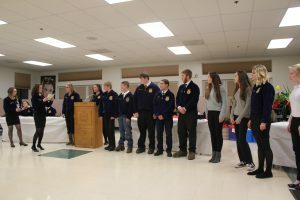 The Coe-Brown Northwood Academy Much-To-Do Chapter of FFA, active for more than 60 years, held its annual banquet on Friday, March 30. 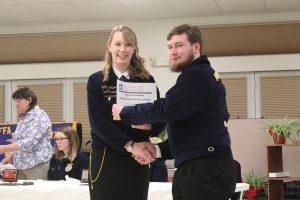 This event, presided over by Sarah Jensen current FFA President, was a banquet for members and their families to celebrate FFA achievements by members during the school year. CBNA student members of FFA, a co-curricular student organization for those who are interested in agriculture and leadership, and one of the three components of agricultural education, were honored with the following awards: Greenhand Degree: Eric Taylor (Nottingham), Ryan Bane (Strafford), Eden Yurek (Deerfield), Jared McHugh (Northwood), Mason Shoup (Strafford), Celia Leighton (Strafford), Makayliah Waterhouse (Strafford), Ben Peverly, (Northwood), Sydney Jacques (Strafford), Kody Bates (Northwood), Ashley Gatchell (Northwood), Tucker Goodwin (Strafford), Kirin Asselin (Candia), Samantha Schroeder (Strafford), Kieran Taylor (Barrington), Kennedi Stowell (Strafford), and Jacob Hobart (Northwood). 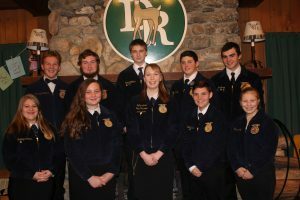 Chapter Degree: Willow Tritter (Northwood), Tucker Hill (Northwood), Molly Swansburg (Strafford), Luke Belbin (Strafford), Joe Whiting (Northwood), Jackson Boucher (Strafford), Elijah Tomlinson-Burrell (Northwood), Daydrian Morin (Nottingham), Dakota McPhee (Northwood), and Courtney Gervais (Northwood). Honorary Membership: Mrs. Amanda Morales, Family and Consumer Studies Teacher. Leclerc FFA Jacket Recipients: Sydney Jacques (Strafford), Olivia Pittman (Northwood) and Ashley Gatchell (Northwood). Proficiency Awards: Agricultural Mechanics Repair & Maintenance: Ben Peverly (Northwood); Agricultural Sales and Services: Madeleine Lounsbury (Northwood); Beef Production: Matthew Messenger (Strafford); Dairy Production Entrepreneurship: Olivia Pittman (Northwood); Dairy Production Placement: Courtney Gervais (Northwood); Diversified Horticulture: Devin Sullivan (Northwood); Diversified Livestock: Joe Garcia (Strafford); Equine Science Placement: Jordan Bell (Nottingham); Nursery Operations: Faith Wilson (Loudon); Outdoor Recreation: Patrick Murray (Northwood); Small Animal Care and Production: John Renner (Strafford). Star Awards: Star Greenhand: Samantha Schroeder (Strafford); Star Farmer: Joe Garcia (Strafford); Star Placement: Madeleine Lounsbury (Northwood); Star Agribusiness: Olivia Pittman (Northwood). The new officer team for the 2018 – 2019 school year is as follows: President: Bailey Travers (Deerfield); Vice-President: Joe Garcia (Strafford); Secretary: Jordan Bell (Nottingham); Treasurer: Colin Gollihur, (Northwood); Reporter: Courtney Gervais, (Northwood); Sentinel: Patrick Murray, (Northwood); Historian: Tyler Millette (Barrington). Congratulations to all of these award winners for their accomplishments and for keeping FFA alive at CBNA. CBNA FFA Greenhand Ceremony (L to R) President Sarah Jensen, Vice-President- Madeleine Lounsbury, Member Celia Leighton, Secretary Bailey Travers, member Ben Peverly, Kody Bates, Ryan Bane, Eric Taylor, Jerod McHugh, Kirin Asselin, Sydney Jacques, Samantha Schroeder and Ashley Gatchell. FFA State President and CBNA Alum Sydney Wilson presenting Patrick Murray with his proficiency in Outdoor Recreation. jzylak@coebrown.org at CBNA or our State and Local Officer, senior Nathaniel Schroeder for details. Members of the Coe-Brown Northwood Academy Much-To-Do FFA chapter, along with advisors Charles Whitten and Sarah Ward, recently attended FFA Winter Leadership Camp, a two day camp focused on Personal Growth and Leadership Skills, presented by Corey Flournoy, former National FFA President and the New Hampshire State FFA Officer team. Located at Camp Brookwoods in Alton, NH, FFA members from across the state gathered together to learn more about themselves in order to learn the skills necessary to grow to be better agriculture leaders. Students participated in individual, small group and large group activities and to learn life skills in cooperation, sharing, role modelling and more. 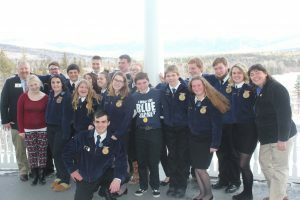 The students truly enjoyed this experience because it gave them an opportunity to meet with other FFA members across the state in a non-competitive atmosphere helping to foster friendships and future agricultural connections. 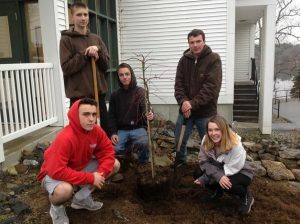 CBNA Landscaping students (left to right) Matt Messenger, Colin Golihur, John Renner, Devin Sullivan, and Sarah Jensen plant tree donated by Patuckaway Nursery. 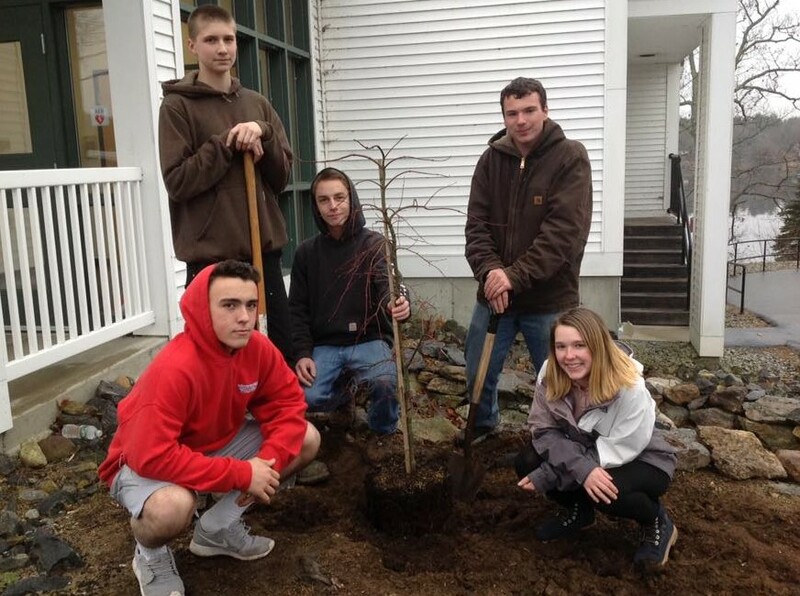 Mark & Carol Davis of Pawtuckaway Nursery in Lee, NH recently donated a Japanese Maple to Coe-Brown Northwood Academy. The tree, which was planted in the Science Building entry way garden by the CBNA Landscaping class on December 5, 2017, is a “Spring Delight” which has cascading threadlike leaves with soft green leaves and pinkish red margins in the spring, turning vivid green in the summer and assorted orange hues in the fall. It will be approximately 7-10’ when mature. For the last two years, the Davis family has also donated interesting specimen trees – a weeping hemlock and a weeping tamarack – which are planted on the grounds of Smith Hall on the CBNA campus. Thank you to Mark and Carol Davis for their generosity, and for helping CBNA maintain and sustain its beautiful grounds.